Baby Beads breastfeeding necklaces are designed to safely keep your baby's attention whilst they feed thus avoiding distractions! No more pinching! Your baby will fall in love with the necklace and enjoy playing with it whilst they feed. The breastfeeding necklaces are intended to be worn by the mother whilst she breastfeeds her baby. It is also completely suitable for bottle-fed babies and can be shared by parents or with carers and grandparents, this builds up trust in the baby and reassures them. The necklaces are designed to be worn by an adult, and the baby to play with it under close supervision. 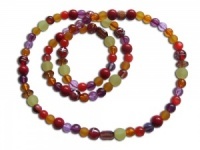 They are specifically made with safety in mind using attractive non-toxic acrylic beads and ultra strong cord tested to 100lbs breaking strain they are also knotted to minimise loss of beads in the unlikely event of a breakage. The necklaces vary in length but are approximately 100 cms/39" in circumference. The basic function of a nursing necklace is to keep your baby’s attention whilst they breast or bottle-feed, to try to prevent the inevitable hair pulling, pinching and scratching. The nursing necklace can also be used for social interaction, bonding, basic education and other play activities. Babybeads-UK nursing necklaces are handmade in the UK by a stay-at-home mum and each item is therefore unique. They are specifically made with safety in mind from attractive non-toxic acrylic beads and individually designed to stimulate your baby. The necklaces are strung on ultra strong cord tested to 100lbs breaking strain and are knotted to minimise loss of beads in the unlikely event of a breakage. This is NOT a baby teether, therefore there is no need to sterilise it. It can be wiped clean with a baby wipe or a dilute solution of milton. By purchasing this necklace you agree to read and understand the following information: This is not a toy and due to the risk of strangulation or choking it must never be worn by a baby or young child. It is our recommendation that it is only ever worn by a sensible adult. Whilst every effort is made to ensure the safety of these products babybeads or Amber Pumpkin will not be held responsible for any injury caused by these products. By buying from us you agree to take responsibility for the proper use of this product, ensuring full supervision at all times. When you are not wearing your necklace it must be kept out of the sight and reach of children.